The Battle of the Wilderness, fought May 5–7, 1864, was the first battle of Lt. Gen. Ulysses S. Grant's 1864 Virginia Overland Campaign against Gen. Robert E. Lee and the Confederate Army of Northern Virginia. Both armies suffered heavy casualties, a harbinger of a bloody war of attrition by Grant against Lee's army and, eventually, the Confederate capital, Richmond, Virginia. The battle was tactically inconclusive, as Grant disengaged and continued his offensive. Grant attempted to move quickly through the dense underbrush of the Wilderness of Spotsylvania, but Lee launched two of his corps on parallel roads to intercept him. On the morning of May 5, the Union V Corps under Maj. Gen. Gouverneur K. Warren attacked the Confederate Second Corps, commanded by Lt. Gen. Richard S. Ewell, on the Orange Turnpike. That afternoon the Third Corps, commanded by Lt. Gen. A.P. Hill, encountered Brig. Gen. George W. Getty's division (VI Corps) and Maj. Gen. Winfield S. Hancock's II Corps on the Orange Plank Road. Fighting until dark was fierce but inconclusive as both sides attempted to maneuver in the dense woods. At dawn on May 6, Hancock attacked along the Plank Road, driving Hill's Corps back in confusion, but the First Corps of Lt. Gen. James Longstreet arrived in time to prevent the collapse of the Confederate right flank. Longstreet followed up with a surprise flanking attack from an unfinished railroad bed that drove Hancock's men back to the Brock Road, but the momentum was lost when Longstreet was wounded by his own men. An evening attack by Maj. Gen. John B. Gordon against the Union right flank caused consternation at Union headquarters, but the lines stabilized and fighting ceased. On May 7, Grant disengaged and moved to the southeast, intending to leave the Wilderness to interpose his army between Lee and Richmond, leading to the bloody Battle of Spotsylvania Court House. In March 1864, Grant was summoned from the Western Theater, promoted to lieutenant general, and given command of all Union armies. He chose to make his headquarters with the Army of the Potomac, although Meade remained the actual commander of that army. He left Maj. Gen. William Tecumseh Sherman in command of most of the western armies. Grant and President Abraham Lincoln devised a coordinated strategy that would strike at the heart of the Confederacy from multiple directions, including attacks against Lee near Richmond, Virginia, and in the Shenandoah Valley, West Virginia, Georgia, and Mobile, Alabama. This was the first time the Union armies would have a coordinated offensive strategy across a number of theaters. Grant's campaign objective was not the Confederate capital of Richmond, but the destruction of Lee's army. Lincoln had long advocated this strategy for his generals, recognizing that the city would certainly fall after the loss of its principal defensive army. Grant ordered Meade, "Wherever Lee goes, there you will go also." Although he hoped for a quick, decisive battle, Grant was prepared to fight a war of attrition. Both Union and Confederate casualties could be high, but the Union had greater resources to replace lost soldiers and equipment. II Corps, under Maj. Gen. Winfield S. Hancock, including the divisions of Maj. Gen. David B. Birney and Brig. Gens. Francis C. Barlow, John Gibbon, and Gershom Mott. V Corps, under Maj. Gen. Gouverneur K. Warren, including the divisions of Brig. Gens. Charles Griffin, John C. Robinson, Samuel W. Crawford, and James S. Wadsworth. VI Corps, under Maj. Gen. John Sedgwick, including the divisions of Brig. Gens. Horatio G. Wright, George W. Getty, and James B. Ricketts. IX Corps, under Maj. Gen. Ambrose Burnside, including the divisions of Brig. Gens. Thomas G. Stevenson, Robert B. Potter, Orlando B. Willcox, and Edward Ferrero. Cavalry Corps, under Maj. Gen. Philip H. Sheridan, including the divisions of Brig. Gens. Alfred T.A. Torbert, David McM. Gregg, and James H. Wilson. First Corps, under Lt. Gen. James Longstreet, including the divisions of Maj. Gen. Charles W. Field and Brig. Gen. Joseph B. Kershaw. Second Corps, under Lt. Gen. Richard S. Ewell, including the divisions of Maj. Gens. Jubal A. Early, Edward "Allegheny" Johnson, and Robert E. Rodes. Third Corps, under Lt. Gen. A.P. Hill, including the divisions of Maj. Gens. Richard H. Anderson, Henry Heth, and Cadmus M. Wilcox. Cavalry Corps, under Maj. Gen. J.E.B. Stuart, including the divisions of Maj. Gens. Wade Hampton, Fitzhugh Lee, and W.H.F. "Rooney" Lee. On May 4, 1864, the Army of the Potomac crossed the Rapidan River at three separate points and converged on the Wilderness Tavern, near edge of the Wilderness of Spotsylvania, an area of more than 70 sq mi (181 km2) of Spotsylvania County and Orange County in central Virginia. Early settlers in the area had cut down the native forests to fuel blast furnaces that processed the iron ore found there, leaving only a secondary growth of dense shrubs. This rough terrain, which was virtually unsettled, was nearly impenetrable to 19th-century infantry and artillery maneuvers. A number of battles were fought in the vicinity between 1862 and 1864, including the bloody Battle of Chancellorsville in May 1863. The Wilderness had been the concentration point for the Confederates one year earlier when Stonewall Jackson launched his devastating attack on the Union right flank at Chancellorsville. But Grant chose to set up his camps to the west of the old battle site before moving southward; unlike the Union army of a year before, Grant had no desire to fight in the Wilderness, desiring to move to the open ground to the south and east of the Wilderness before fighting Lee, taking advantage of his superior numbers and artillery. Grant's plan was for the V Corps (Warren) and VI Corps (Sedgwick) to cross the Rapidan at Germanna Ford, followed by the IX Corps (Burnside) after the supply trains had crossed at various fords, and to camp near Wilderness Tavern. The II Corps (Hancock) would cross to the east on Ely's Ford and advance to Spotsylvania Court House by way of Chancellorsville and Todd's Tavern. Speed was of the essence to the plan because the army was vulnerably stretched thin as it moved. Although Grant insisted that the army travel light with minimal artillery and supplies, its logistical "tail" was almost 70 miles. Sylvanus Cadwallader, a journalist with the Army of the Potomac, estimated that Meade's supply trains alone—which included 4,300 wagons, 835 ambulances, and a herd of cattle for slaughter—if using a single road would reach from the Rapidan to below Richmond. Grant gambled that Meade could move his army quickly enough to avoid being ensnared in the Wilderness, but Meade recommended that they camp overnight to allow the wagon train to catch up. Grant also miscalculated when he assumed that Lee was incapable of intercepting the Union army at its most vulnerable point, and Meade had not provided adequate cavalry coverage to warn of a Confederate movement from the west. On May 2, Lee met with his generals on Clark Mountain, obtaining a panoramic view of the enemy camps. He realized that Grant was getting ready to attack, but did not know the precise route of advance. He correctly predicted that Grant would cross to the east of the Confederate fortifications on the Rapidan, using the Germanna and Ely Fords, but he could not be certain. To retain flexibility of response, Lee had dispersed his Army over a wide area. Longstreet's First Corps was around Gordonsville, from where they had the flexibility to respond by railroad to potential threats to the Shenandoah Valley or to Richmond. Lee's headquarters and Hill's Third Corps were outside Orange Court House. Ewell's Second Corps was the closest to the Wilderness, at Morton's Ford. [In the Wilderness] numbers meant little—in fact, they were frequently an encumbrance on the narrow trails. Visibility was limited, making it extremely difficult for officers to exercise effective control. Attackers could only thrash noisily and blindly forward through the underbrush, perfect targets for the concealed defenders. In attack or retreat, formations could rarely be maintained. In this near-jungle, the Confederates had the advantages of being, on the whole, better woodsmen than their opponents and of being far more familiar with the terrain. Federal commanders were forced to rely upon maps, which soon proved thoroughly unreliable. As Grant's plan became clear to Lee on May 4, Lee knew that it was imperative to fight in the Wilderness for the same reason as the year before: his army was massively outnumbered, with approximately 65,000 men to Grant's 120,000, and his artillery had fewer, inferior guns than those of Grant's. 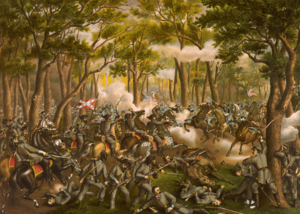 Fighting in the tangled woods would eliminate Grant's advantage in artillery, and also the close quarters and ensuing confusion there could give Lee's outnumbered force better odds. He therefore ordered his army to intercept the advancing Federals in the Wilderness. Ewell marched east on the Orange Court House Turnpike, reaching Robertson's Tavern, where they camped about 3–5 miles from the unsuspecting soldiers in Warren's corps. Hill used the Orange Plank Road and stopped at the hamlet of New Verdiersville. These two corps could pin the Union troops in place (ordered to avoid a general engagement until the entire army could be united), fighting outnumbered for at least a day while Longstreet approached from the southeast for a blow against the enemy's flank, similar to Jackson's at Chancellorsville. The thick underbrush prevented the Union Army from recognizing the proximity of the Confederates. Adding to the confusion, Meade received an erroneous report that the Confederate cavalry under Jeb Stuart was operating in his Army's rear, in the direction of Fredericksburg. He ordered the bulk of his cavalry to move east to deal with that perceived threat, leaving his army blind. But he assumed that the corps of Sedgwick, Warren, and Hancock could hold back any potential Confederate advance until the supply trains came up, at which time Grant could move forward to engage in a major battle with Lee, presumably at Mine Run. Early on May 5, Warren's V Corps was advancing over farm lanes toward the Plank Road when Ewell's Corps appeared in the west. Grant was notified of the encounter and instructed "If any opportunity presents itself of pitching into a part of Lee's army, do so without giving time for disposition." Meade halted his army and directed Warren to attack, assuming that the Confederates were a small, isolated group and not an entire infantry corps. Ewell's men erected earthworks on the western end of the clearing known as Saunders Field. Warren approached on the eastern end with the division of Brig. Gen. Charles Griffin on the right and the division of Brig. Gen. James S. Wadsworth on the left, but he hesitated to attack because the Confederate position extended beyond Griffin's right, which would mean that they would be subjected to enfilade fire. He requested a delay from Meade so that Sedgwick's VI Corps could be brought in on his right and extend his line. By 1 p.m., Meade was frustrated by the delay and ordered Warren to attack before Sedgwick could arrive. Warren was correct to be concerned about his right flank. As the Union men advanced, Brig. Gen. Romeyn B. Ayres's brigade had to take cover in a gully to avoid the enfilading fire. The brigade of Brig. Gen. Joseph J. Bartlett made better progress to Ayres's left and overran the position of Brig. Gen. John M. Jones, who was killed. However, since Ayres's men were unable to advance, Bartlett's right flank was now exposed to attack and his brigade was forced to flee back across the clearing. Bartlett's horse was shot out from under him and he barely escaped capture. To the left of Bartlett, the Iron Brigade, commanded by Brig. Gen. Lysander Cutler, advanced through woods south of the field and struck a brigade of Alabamians commanded by Brig. Gen. Cullen A. Battle. Although initially pushed back, the Confederates counterattacked with the brigade of Brig. Gen. John B. Gordon, tearing through the line and forcing the Iron Brigade to flee for the first time in its history. I saw many wounded soldiers in the Wilderness who hung on to their rifles, and whose intention was clearly stamped on their pallid faces. I saw one man, both of whose legs were broken, lying on the ground with his cocked rifle by his side and his ramrod in his hand, and his eyes set on the front. I knew he meant to kill himself in case of fire—knew it is surely as though I could read his thoughts. Further to the left, near the Higgerson farm, the brigades of Col. Roy Stone and Brig. Gen. James C. Rice attacked the brigades of Brig. Gen. George P. Doles's Georgians and Brig. Gen. Junius Daniel's North Carolinians. Both attacks failed under heavy fire and Crawford ordered his men to pull back. Warren ordered an artillery section into Saunders Field to support his attack, but it was captured by Confederate soldiers, who were pinned down and prevented by rifle fire from moving the guns until darkness. In the midst of hand-to-hand combat at the guns, the field caught fire and men from both sides were shocked as their comrades burned to death. The lead elements of Sedgwick's VI Corps reached Saunders Field at 3 p.m., by which time Warren's men had ceased fighting. Sedgwick attacked Ewell's line in the woods north of the Turnpike and both sides traded attacks and counterattacks that lasted about an hour before each disengaged to erect earthworks. During the fray, Confederate Brig. Gen. Leroy A. Stafford was felled with a severed spine, but continued to send his Louisiana troops into battle. Unable to duplicate the surprise that was achieved by Ewell on the Turnpike, A.P. Hill's approach was detected by Brig. Gen. Samuel W. Crawford's men from their position at the Chewning farm, and Meade ordered the VI Corps division of Brig. Gen. George W. Getty to defend the important intersection of the Orange Plank Road and the Brock Road. Union cavalry under Brig. Gen. James H. Wilson, employing repeating carbines, succeeded in briefly delaying Hill's approach. Getty's men arrived just before Hill's and the two forces skirmished briefly, ending with Hill's men withdrawing a few hundred yards west of the intersection. A mile to the rear, Lee established his headquarters at the Widow Tapp's farm. Lee, Jeb Stuart, and Hill were meeting there when they were surprised by a party of Union soldiers entering the clearing. The three generals ran for safety and the Union men, who were equally surprised by the encounter, returned to the woods, unaware of how close they had come to changing the course of history. Meade sent orders to Hancock directing him to move his II Corps north to come to Getty's assistance. By 4 p.m., initial elements of Hancock's corps were arriving and Meade ordered Getty to assault the Confederate line. As the Union men approached the position of Maj. Gen. Henry Heth, they were pinned down by fire from a shallow ridge to their front. As each II Corps division arrived, Hancock sent it forward to assist, bringing enough combat power to bear that Lee was forced to commit his reserves, the division commanded by Maj. Gen. Cadmus M. Wilcox. Fierce fighting continued until nightfall with neither side gaining an advantage. Grant's plan for the following day assumed that Hill's Corps was essentially spent and was a prime target. He ordered an early morning assault down the Orange Plank Road by the II Corps and Getty's division. At the same time, the V and a VI Corps were to resume assaults against Ewell's position on the Turnpike, preventing him from coming to Hill's aid, and Burnside's IX Corps was to move through the area between the Turnpike and the Plank Road and get into Hill's rear. If successful, Hill's Corps would be destroyed and then the full weight of the army could follow up and deal with Ewell's. Although he was aware of the precarious situation on the Plank Road, rather than reorganizing his line, Lee chose to allow Hill's men to rest, assuming that Longstreet's Corps, now only 10 miles from the battlefield, would arrive in time to reinforce Hill before dawn. When that occurred, he planned to shift Hill to the left to cover some of the open ground between his divided forces. Longstreet calculated that he had sufficient time to allow his men, tired from marching all day, to rest and the First Corps did not resume marching until after midnight. Moving cross-country in the dark, they made slow progress and lost their way at times, and by sunrise had not reached their designated position. As planned, Hancock's II Corps attacked Hill at 5 a.m., overwhelming the Third Corps with the divisions of Wadsworth, Birney, and Mott; Getty and Gibbon were in support. Ewell's men on the Turnpike had actually attacked first, at 4:45 a.m., but continued to be pinned down by attacks from Sedgwick's and Warren's corps and could not be relied upon for assistance. Lt. Col. William T. Poague's 16 guns at the Widow Tapp farm fired canister tirelessly, but could not stem the tide and Confederate soldiers streamed toward the rear. Before a total collapse, however, reinforcements arrived at 6 a.m., Brig. Gen. John Gregg's 800-man Texas Brigade, the vanguard of Longstreet's column. General Lee, relieved and excited, waved his hat over his hand and shouted, "Texans always move them!" Caught up in the excitement, Lee began to move forward with the advancing brigade. As the Texans realized this, they halted, refusing to move forward until Lee moved to the rear, grabbing the reins of Lee's horse, Traveller. Longstreet was able to convince Lee that he had matters well in hand and the commanding general relented. Like a fine lady at a party, Longstreet was often late in his arrival at the ball. But he always made a sensation and that of delight, when he got in, with the grand old First Corps sweeping behind him as his train. Longstreet counterattacked with the divisions of Maj. Gen. Charles W. Field on the left and Brig. Gen. Joseph B. Kershaw on the right. The Union troops, somewhat disorganized from their assault earlier that morning, could not resist and fell back a few hundred yards from the Widow Tapp farm. The Texans leading the charge north of the road fought gallantly at a heavy price—only 250 of the 800 men emerged unscathed. At 10 a.m., Longstreet's chief engineer reported that he had explored an unfinished railroad bed south of the Plank Road and that it offered easy access to the Union left flank. Longstreet assigned his aide, Lt. Col. Moxley Sorrel, to the task of leading four fresh brigades along the railroad bed for a surprise attack. Sorrel and the senior brigade commander, Brig. Gen. William Mahone, struck at 11 a.m. Hancock wrote later that the flanking attack rolled up his line "like a wet blanket." At the same time, Longstreet resumed his main attack, driving Hancock's men back to the Brock Road, and mortally wounding Brig. Gen. James S. Wadsworth. At the Turnpike, inconclusive fighting proceeded for most of the day. Early in the morning, Brig. Gen. John B. Gordon scouted the Union line and recommended to his division commander, Jubal Early, that he conduct a flanking attack, but Early dismissed the venture as too risky. According to Gordon's account after the war, General Lee visited Ewell and ordered him to approve Gordon's plan, but other sources discount Lee's personal intervention. In any event, Ewell authorized him to go ahead shortly before dark. Gordon's attack made good progress against inexperienced New York troops who had spent the war up until this time manning the artillery defenses of Washington, D.C., but eventually the darkness and the dense terrain took their toll as the Union flank received reinforcements and recovered. Sedgwick's line was extended overnight to the Germanna Plank Road. For years after the war, Gordon complained about the delay in approving his attack, claiming "the greatest opportunity ever presented to Lee's army was permitted to pass." Reports of the collapse of this part of the Union line caused great consternation at Grant's headquarters, leading to an interchange that is widely quoted in Grant biographies. An officer accosted Grant, proclaiming, "General Grant, this is a crisis that cannot be looked upon too seriously. I know Lee's methods well by past experience; he will throw his whole army between us and the Rapidan, and cut us off completely from our communications." Grant seemed to be waiting for such an opportunity and snapped, "Oh, I am heartily tired of hearing about what Lee is going to do. Some of you always seem to think he is suddenly going to turn a double somersault, and land in our rear and on both of our flanks at the same time. Go back to your command, and try to think what we are going to do ourselves, instead of what Lee is going to do." On the morning of May 7, Grant was faced with the prospect of attacking strong Confederate earthworks. Instead, he chose maneuver. By moving south on the Brock Road, he hoped to reach the crossroads at Spotsylvania Court House, which would interpose his army between Lee and Richmond, forcing Lee to fight on ground more advantageous to the Union army. He ordered preparations for a night march on May 7 that would reach Spotsylvania, 10 mi (16 km) to the southeast, by the morning of May 8. Unfortunately for Grant, inadequate cavalry screening and bad luck allowed Lee's army to reach the crossroads before sufficient Union troops arrived to contest it. Once again faced with formidable earthworks, Grant fought the bloody Battle of Spotsylvania Court House (May 8–21) before maneuvering yet again as the campaign continued toward Richmond. Although the Wilderness is usually described as a draw, it could be called a tactical Confederate victory, but a strategic victory for the Union army. Lee inflicted heavy numerical casualties (see estimates below) on Grant, but as a percentage of Grant's forces they were smaller than the percentage of casualties suffered by Lee's smaller army. And, unlike Grant, Lee had very little opportunity to replenish his losses. Understanding this disparity, part of Grant's strategy was to grind down the Confederate army by waging a war of attrition. The only way that Lee could escape from the trap that Grant had set was to destroy the Army of the Potomac while he still had sufficient force to do so, but Grant was too skilled to allow that to happen. Thus, the Overland Campaign, initiated by the crossing of the Rappahannock, and opening with this battle, set in motion the eventual destruction of the Army of Northern Virginia. Both flanks had been badly bruised, and [Grant's] 17,500 casualties in two days exceeded the Confederate total by at least 7,000. Under such circumstances previous Union commanders in Virginia had withdrawn behind the nearest river. Men in the ranks expected the same thing to happen again. But Grant had told Lincoln "whatever happens, there will be no turning back." While the armies skirmished warily on May 7, Grant prepared to march around Lee's right during the night to seize the crossroads village of Spotsylvania a dozen miles to the south. If successful, this move would place the Union army closer to Richmond than the enemy and force Lee to fight or retreat. All day Union supply wagons and the reserve artillery moved to the rear, confirming the soldiers' weary expectation of retreat. After dark the blue divisions pulled out one by one. But instead of heading north, they turned south. A mental sunburst brightened their minds. It was not another "Chancellorsville ... another skedaddle" after all. "Our spirits rose," recalled one veteran who remembered this moment as a turning point in the war. Despite the terrors of the past three days and those to come, "we marched free. The men began to sing." For the first time in a Virginia campaign the Army of the Potomac stayed on the offensive after its initial battle. Gordon C. Rhea acknowledges the officially reported Union casualties of 17,666, but suspects that some of the returns—particularly in Warren's corps—were falsified on the low side, to minimize the negative impact of the battle on the public. He estimates Grant's loss at 17%. He accepts Union estimates of 11,000 Confederate casualties. Portions of the Wilderness battlefield are preserved as part of Fredericksburg and Spotsylvania National Military Park, established in 1927 to memorialize the battlefields of Fredericksburg, Chancellorsville, Spotsylvania Court House, and the Wilderness. In addition to this land that has been protected by the National Park Service, several volunteer organizations have been active in preservation activities. The Friends of the Wilderness Battlefield have been active in helping to preserve and enhance the Ellwood Mansion, which was the headquarters for both Gouverneur K. Warren and Ambrose Burnside during the battle and the family cemetery there holds the plot where Stonewall Jackson's arm was buried. While the NPS acquired 180 acres (73 ha) of Ellwood in the 1970s, the FOWB is responsible for the preservation of the 1790s-era house and its interpretation. The Civil War Preservation Trust in 2008 began a campaign to prevent the development of a 138,000-square-foot (3-acre; 12,821 m2) Wal-Mart Supercenter on a 55-acre (22 ha) tract north of the intersection of Routes 3 (the Germanna Highway) and 20 (the Orange Turnpike), immediately across Route 3 from the National Military Park, near the site of the Wilderness Tavern. Other organizations supporting the campaign are the Vermont state legislature and the "Wilderness Battlefield Coalition", which includes the Piedmont Environmental Council, the National Trust for Historic Preservation, the National Parks Conservation Association, Friends of the Wilderness Battlefield, and Friends of the Fredericksburg Area Battlefields. Steve Szkotak of the Associated Press reported on May 4, 2009 (one day before the 145th anniversary of the battle), that actor Robert Duvall (who is a descendant of Robert E. Lee) was joined with Representatives Ted Poe (R-Texas) and Peter Welch (D-Vermont) in making a pledge "to do 'anything we can' to support the fight against the Wal-Mart store" and further added that they'll "graciously chase out Wal-Mart". Duvall is the first Hollywood celebrity to fight against the construction proposition, which had previously "drawn opposition from 250 historians, including David McCollough and James McPherson, and film-maker Ken Burns." Wal-Mart has argued that the store's location "near a strip mall and across from McDonald's will not diminish the battlefield." Local supporters for Wal-Mart also argue that the store "could bring needed jobs and tax revenue to the rural county." On August 25, 2009, after a public hearing the day before, the Orange County Board of Supervisors voted 4 to 1 in favor of Wal-Mart building their store next to the battlefield. However, preservationists vowed a court fight to block the construction and urged Wal-Mart to reconsider their location. And on September 23, 2009, the National Trust for Historic Preservation and Friends of Wilderness Battlefield along with residents of Orange and Spotsylvania Counties filed a legal challenge against the proposed big-box development on the battlefield. This entry was posted on October 4, 2009 at 12:14 pm, and is filed under Major Land American Civil War Battles . Follow any responses to this post through RSS. You can leave a response, or trackback from your own site.